This was like a visual war between intoxicating Parisian magical delights...vs extreme poverty and desperation. And books that blend such extremes so well just deserve total applause. It really took you to Paris! I love travelling through books (less expensive and also less jetlag, which is nice) but it's tricky to get that balance where you really feel in the story. Enchantee nailed it. ➸ It's set in 1700s Paris, mostly in Versailles. And oh wow, the COURTS. The mad richness of the aristocracy and how they just threw around money and favours and gambled and drank...while the poor people literally died in the streets of starvation. And we're also here on the brink of inventions, so the hot air balloon takes a huge part of the story (getting it, ya know, floating right) and Camille's dad used to run a printing press where he was determined to spread true news and free thoughts (lol that didn't go down well, thanks France) and the age of obscene rich people is teetering towards collapse. Ugh I loved this give me moar. ➸ Camille is the Softest...but also has a total craving for power. She's a magician but she starts of turning bits of scrap metal into coins and that's it. But then she moves onto enchanted dresses and glamouring her face and changing cards to work in her favour for gambling...like she just loves that feeling of being in control. Which is so understandable?!? Her "real" life is extreme poverty + being abused by her older brother + trying to care for a sickly sister. So when she figures she can get into Versailles and gamble and WIN (through trickery mwhaha) she GOES FOR IT. Of course magic has a price = and it's eating away at her. But I loved how she kept her soul throughout all the book. She's so passionate about who she loves and protects. Eeep. Ok but I have to admit (1) I hated how they had this abusive brother Alian who constantly got forgiven, and (2) he literally puts a knife to Camille's throat, but Sophie was still going to trust him?!? Tf, ladies. You can't save this one. Throw the whole man out. ➸ The romance is pretty much super cute. Basically Lazare crash lands a balloon and Camille sprints over to save him and ...aww what a meet cute! I'm here for it! I also liked the added tension of them both leading double lives and how that collided. And the romance was taut but not irritatingly angsty?! Bless. ➸ And am here for loving diversity rep.
Lazare is biracial, his mother is from India and his father is a French aristocrat. And he does get mocked for it. He even calls out Camille's white privilege at one point and I think it was an important moment. And there's also an adorable side queer couple who I ached for because they go through a lot. But it was so good to see diversity in magical-historical fiction!! Like PROOF to anyone who says "oh it wasn't historically accurate..." as an excuse for skipping it, that they have no grounds to stand on. ...it's still super long. 450 pages is l o n g. I could've done for it to be a bit tighter to keep the tension high. Because holy WOW that ending is stressful. This is such a magical story of deception and love, of how easy it is to fall into the glittering addictive lure of money and being in control. It's a beautifully written story and it totally swallows your whole attention while you root for Camille to beat back the unfair world and have the life she deserves. 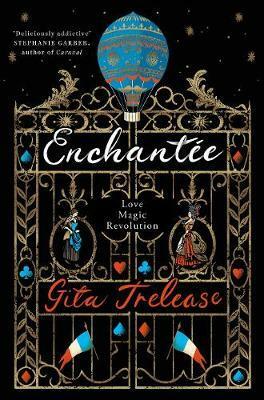 Sign into Goodreads to see if any of your friends have read Enchantée. 42.29% "this is so pretty and glittery"
You have definitely convinced me to pick this one up next! I’m so here for immersive fantasy. ahhh I'm so glad I was convincing!! I almost picked this up last week. Looked on Goodreads and the reviews didn't convince me, if I had seen this I definitely would have bought it. Regretting that a lot now. I hope you get a chance to read it some other time then!! Sounds like this one worked better for you than for me. I'm not sure if I was just depressed when I read it (I mean, I was, but idk if that was the main factor), but somehow it never really won me over. I kept thinking it would and then it didn't. Miriam wrote: "Sounds like this one worked better for you than for me ..."
I have a ton of books I always feel like I should've loved but I wasn't in the right headspace for them...so you're not alone!